The fourth convoy organized by a former British parliamentarian to aid the Hamas-controlled government in Gaza is scheduled to depart Saturday from London, Morocco and Qatar, again raising tensions over potential clashes with Israeli and Egyptian officials enforcing a blockade on Gaza. This attempt to "bring humanitarian aid to the Palestinian people in the Gaza Strip" comes amid growing evidence that past aid ventures have been diverted to support Hamas military efforts. And it comes despite Israel's decision to greatly reduce the list of materials banned from entering Gaza. Even under the old blockade restrictions, a top United Nations official challenged the fundamental premise driving relief efforts. "There is no humanitarian problem in Gaza," United Nations Middle East envoy Robert Serry said earlier this year. 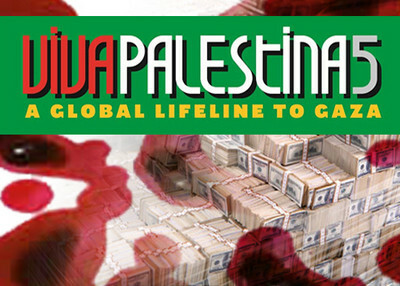 The convoy is spearheaded by Viva Palestina (VP), a group headed by former British MP George Galloway which has already sent three convoys to Gaza and delivered millions of dollars to the Hamas government there. In addition to the convoy, dubbed "Viva Palestina 5 – a global lifeline to Gaza," VP is supporting an international flotilla, with contingents from the U.S., Canada, Europe, India, South Africa and other countries in the Middle East. It plans to arrive in Gaza at the same time as the VP land convoys, in early October. VP claims it will bring "medical equipment, educational supplies and the wherewithal to rebuild a destroyed mosque, a school for orphans and to construct a maternity facility in Beit Hanoun in northern Gaza." The group stated "we will be taking Aid to Gaza that has been specified by the organisations within Gaza as being required." VP also has a campaign to purchase "cement" to "Help Gaza Rebuild," an item that is only allowed to enter Gaza for projects authorized by the Palestinian Authority (PA) and "implemented and monitored by the international community." Israel notes that cement can be used for Hamas military purposes, such as building bunkers and digging tunnels. In the past, VP has not worked with the PA or the international community, but directly with the Hamas government and organizations in Gaza. The VP convoy is comprised of activists from the US, the UK, Ireland, Australia, New Zealand, Malaysia, Canada, Italy and other countries. It will travel through France, Italy, Greece, Turkey, Syria and Egypt, from where it plans to enter Gaza. In Syria, the convoy will be joined by dozens of trucks coming from the Arab Gulf and Jordan, organized by the Islamist Jordanian Lifeline Committee and the Kuwaiti Popular Committee to Break the Siege. When the third VP convoy stopped in Syria in December, 2009, it was greeted by Usama Hamdan, a Hamas representative from Lebanon and a Special Designated Global Terrorist (SDGT), as well as by Musa Abu Marzook, a Syrian Hamas leader, and also an SDGT. The international flotilla is headed by IHH, the Free Gaza Movement (FGM), and the European Campaign to End the Siege of Gaza, the same organizations that led the May flotilla effort, with other groups. Plans for the current flotilla began as early as June, when IHH held a press conference at the European Parliament in Strasbourg. Some leaders of the upcoming flotilla are in contact with Hamas, according to the Meir Amit Intelligence and Terrorism Information Center based in Israel. The California-based Free Palestine Movement (FPM) is an offshoot of FGM, and claims to be "a human rights organization," although its actions and plans contradict this statement. FPM had a small delegation, including Ambassador Edward Peck and Paul Larudee, which participated in the first flotilla. Iranian-born Paul Larudee, co-founder of the Free Gaza Movement and the founder of The Free Palestine Movement, said that the organization will participate in the upcoming flotilla and that the organization also plans to send an airplane to Gaza in 2011. He also praised the passengers on the Mavi Marmara ship who violently attacked Israeli commandos as they tried to board, writing that "I admire them for doing so; they knew that Israel has a reputation for disproportionate response." The Free Palestine Movement's website states that shortly after the May flotilla the organization "was called to a meeting in Beirut of more than twenty organizations committed to new efforts to break the siege." FPM has since held a number of fundraising events for the upcoming flotilla and its other plans related to undermining Israel. Another group, The U.S. Boat to Gaza campaign, is raising funds to join the upcoming flotilla. Its website states that "Gaza is essentially an open-air prison under a U.S.-backed Israeli blockade" and "We must join with others from across the world to support an end to the collective punishment of 1.5 million Palestinians in Gaza." It is endorsed by dozens of organizations, including FGM, the Muslim Students Association West (MSA-West) and the radical Adalah-NY group. U.S. Boat to Gaza, too, has held a number of events to raise its goal of $370,000. The previous flotilla and VP's last convoy each ended in violence. Nine passengers were killed on the Mavi Marmara. Videotapes and other evidence show a number of passengers expressed a desire for "martyrdom" before the confrontation and investigations show the violence had been planned. Likewise, in January, participants of the third Viva Palestina convoy clashed with Egyptian riot police, resulting in the death of one Egyptian soldier. Galloway was also declared persona non grata by the Egyptian Ministry, barring him from entering the country again. Galloway recently implored Egyptian President Mubarak to allow him and the convoy to enter Gaza via the El-Arish port, stating, "I don't want any dispute with Egypt which Israel might exploit to its interests. I say to Mubarak from Algeria, please let us pass through." In its latest convoy, Viva Palestina once again joins forces with IHH, the Turkish organization that sponsored the Mavi Marmara ship of the May 31st flotilla, and deliberately orchestrated the violent confrontation with Israel in the Mediterranean Sea. VP partnered with IHH during its third convoy that arrived in Gaza in January. IHH's ties to Hamas have been confirmed by the U.S. government, and the group is under investigation for a potential designation by the State Department. As IPT previously reported, IHH assisted al-Qaida in the 1990s, and currently openly supports and transfers money to Hamas. IHH is also a member of the Union of the Good, a group designated by the U.S. State Department in 2008 for its support for Hamas. In June, The New York Times reported that Mehmet Kaya, who runs the IHH office in Gaza, said, "We only work through Hamas, although we don't limit our aid to its followers." And, "We consider Israel and the United Nations to be the terrorists, not Hamas." Galloway's support for IHH continue unabated. But he famously announced that his goal is not humanitarian, but political, to support the Hamas government in Gaza. At a June 5th protest outside of the Israeli embassy in London, where flags of Turkey and Hizballah waved, Galloway announced that he flew to Turkey to attend "the funerals of the martyrs" who died on the Mavi Marmara. Galloway's respect for the nine killed, seven of whom declared their desire to die as shaheeds during their mission to fight Israel, echoes the words of IHH head, Bulent Yildirim. Yildirim called them "brave, freedom fighters, who sacrificed everything they had for the sake of the cause," in a speech he recently delivered to activists who were on the Mavi Marmara. Yildirim was on the ship, too, and prepared the IHH operatives to engage the Israeli Defense Forces (IDF) violently. He ordered the operatives to "form a human chain and throw the IDF soldiers back into the sea using chairs and iron bars" if they managed to board the ship. Yildirim and IHH do not hide their support for Hamas. Yildirim gave a speech at a Hamas rally in Gaza in February 2009, stating, "From here, I call upon all the leaders of the Islamic world, and upon all the peoples…Anyone who does not stand alongside Palestine – his throne will be toppled," and "What can the enemy do to me? I carry Paradise in my heart. If they deport me – it would be a trip. If they imprison me – I will be able to spend some time alone. If they kill me – that is martyrdom for the sake of Allah. Allah Akbar." IHH's website contains reports of Hamas officials' visits to Turkey and meetings with IHH officials. At one joint press conference held with IHH, senior Hamas spokesman Sami Abu Zuhri said, "Resistance will continue until entire Palestine has been recovered and a Palestinian state is established." Given the track record of Viva Palestina and IHH, both of the upcoming land and sea missions may result in violence. In fact, Israel has been diligently preparing for such an encounter.